& from Republic of Ireland / Éire including Cregganbaun. These tins of talc were for use in bathrooms & that's where they went. Most of these that surface are seriously rusted &/or dented as a consequence. This tin is wonderfully free of ANY dents or ANY rust, save a little around the bottom lip. The bottom of the tin still shines, something that few surviving tins can boast. The only signs of it being a fifty year old tin of bath talc are individual rust 'freckles' around the base lip, making this a remarkable near mint condition tin & as good as you will ever find. The pictures & indeed the Beatles logo used on the tin date to 1963, although the tin was actually issued in 1964. The main pictures are in black & white with the header & footer text being in red & white, these are different formats on the front & back, although the Beatles logo in black is the same. As if that wasn't enough, this tin is still NEARLY FULL. So, if it takes your fancy, you could sprinkle some on after your own shower & go out & greet the world with a wonderful 'Fab' fragrance ! A superb & very rare item in extraordinary near mint condition! 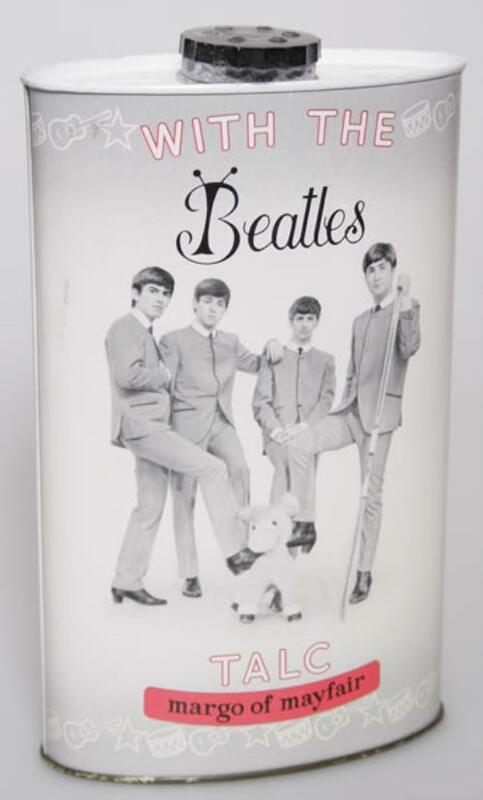 Product Information The Beatles With The Beatles Talc UK memorabilia.